West, I.M. 2017. 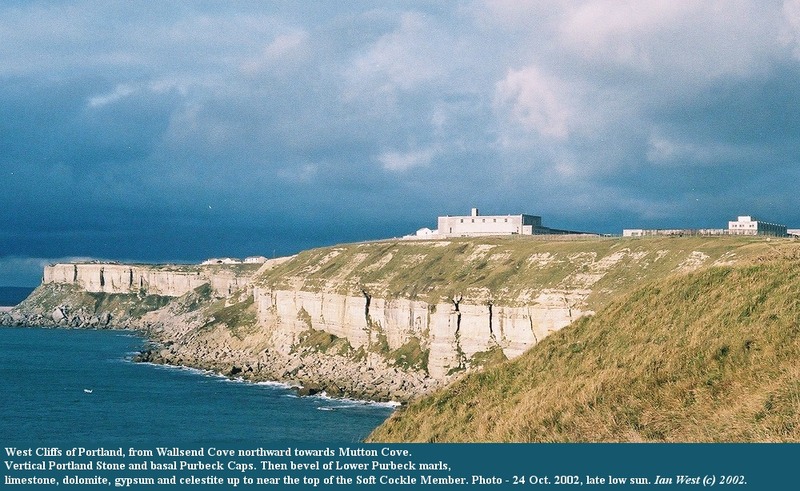 The Isle of Portland - Mutton Cove to Wallsend: Geology of the Wessex Coast. Internet field guide. http://www.southampton.ac.uk/~imw/portmutton.htm. version: 18th June 2017. Some general information regarding safety on Dorset geological field trips is provided and you are requested to read this if going to localities described here. More specific hazards with regard to the west coast of the Isle of Portland, particularly between Mutton Cove and Wallsend and adjacent areas are now discussed briefly. Like almost everywhere else on the Dorset coast care must be taken with regard to hazard of falling rocks. Safety helmets should be worn beneath cliffs, and any places where there are indications of freshly fallen rock should be strictly avoided. 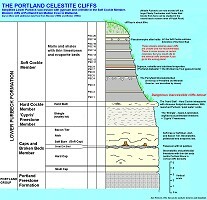 It is important not to hammer the chert in the Portland and Purbeck strata because dangerous and penetrating splinters. At the centre of Mutton Cove there is some access to the higher strata above an old quarry in the cliff top. A short distance further south there are paths down to the undercliff and beach, and they are much used by rock climbers for access to the rock faces. Even here caution is needed. The fallen rocks at the foot of the cliffs on this stretch of coast are full of geological interest but require much physical effort to scramble over them and there is risk of injury in falling from a block. Few people proceed along the foot of the cliffs and in the case of an accident the victim may not be seen for a long time. Further south towards Wallsend there is no easy access to the shore. The cliff edges on the west coast of Portland can be very dangerous. The upper slopes of the cliffs in the Mutton Cove to Wallsend stretch contain interesting Purbeck strata. 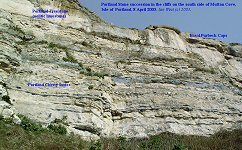 These slopes, however, are at steep angles and mostly very hazardous because they lie above a vertical face of Portland Stone. Only in a few places are the Hard and Soft Cockle Members accessible at all, and most of these cliff-top slopes are too dangerous for use. Please note that the provision of an image or description of any location here does not constitute a recommendation to visit it and no liability is accepted. Individuals or parties undertaking field work should make their own risk assessments. 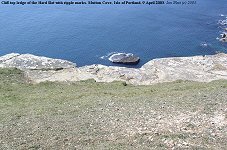 In April 2003 a 12 year old girl fell over the cliff top at Blacknor, near Mutton Cove, but was stopped by a ledge about 10m down. She was airlifted to hospital by helicopter with head injuries ( (Anonymous, 2003). Several years ago a person injured in an accident in a cave at Blacknor was taken to hospital by helicopter. As shown on the top-left map, the cliffs from Mutton Cove to Wallsend form much of the western boundary of the peninsula. Mutton Cove, presumably named after the once-famous Portland sheep, is an erosional indentation just south of the promontory of Blacknor. 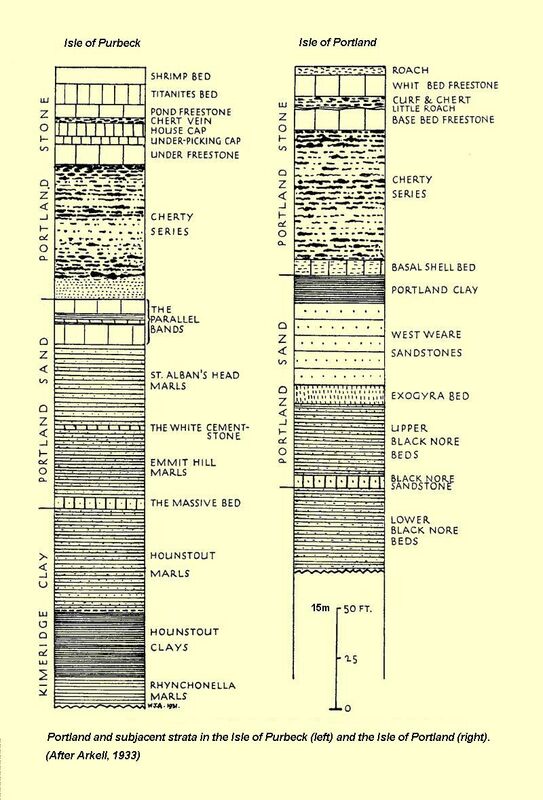 Wallsend is where the wall of Portland Stone almost ends as the strata dip soutward. 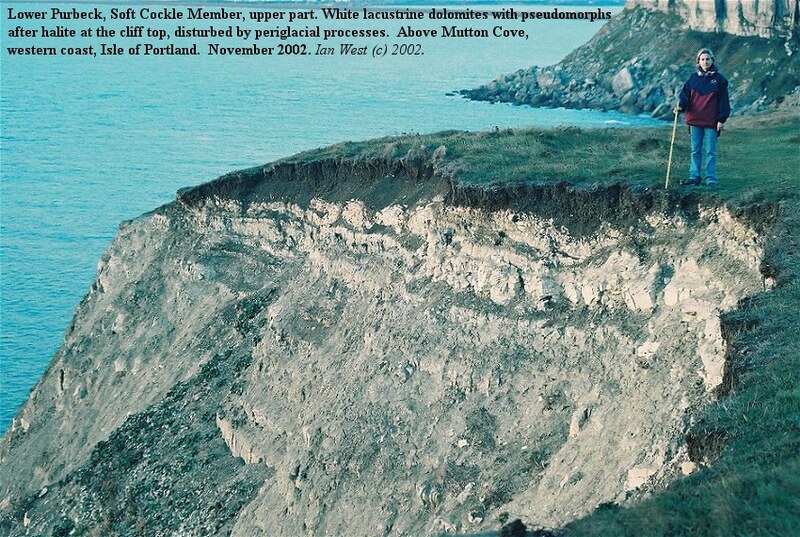 The top-centre image shows the cliff and adjacent area with north at the top of the photograph. To the east is the edge of a housing estate (part of Weston) where there is a small car park. The image also shows the position of the footpath at the old weare (quarry tip) that allows access to undercliff for walkers without climbing. The top-right image shows the view from the cliffs to the south. A wall of large stone blocks can be seen near the cliff-top at the right of this photograph. That is the protecting wall of a small quarry in Portland Stone. The bottom-left image shows a rider travelling northward towards Mutton Cove on the cliff-top path. The bottom-right image shows the cliff top just south of the small quarry at Mutton Cove. There is a scramble route to descend the cliff here, but easier access is available by the steep footpaths at the weare, referred to above. From Mutton Cove there is a good view of Blacknor. 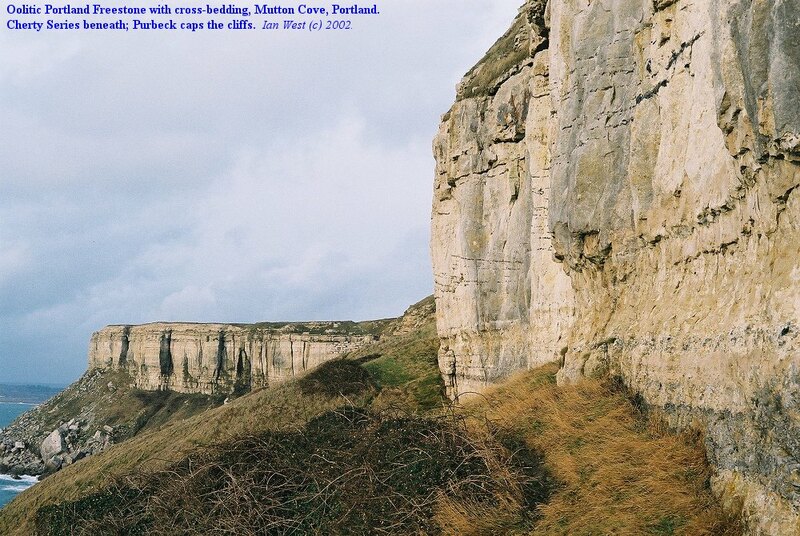 Here the Portland Stone forms a vertical wall above a slope of Portland Sands. 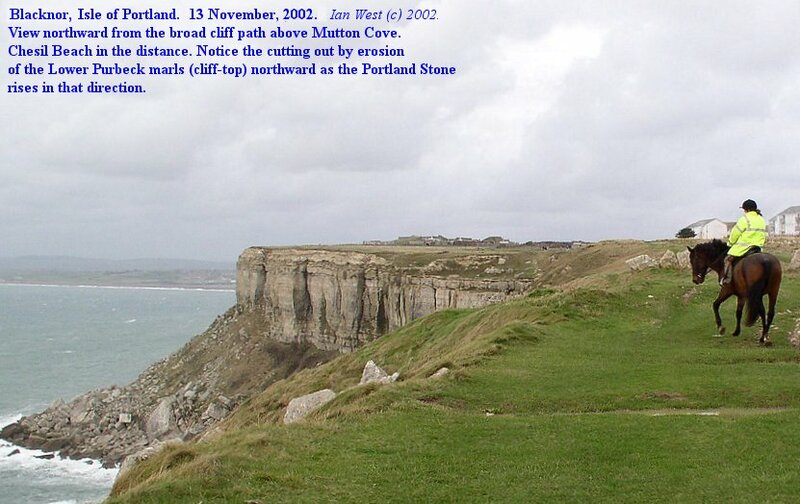 The Purbeck strata at the top of the cliff are only basal Purbeck, the higher parts have been cut off by erosion. Notice the fallen stone debris at the foot of the cliff. Most of this is natural but quarry debris has been added in the past. 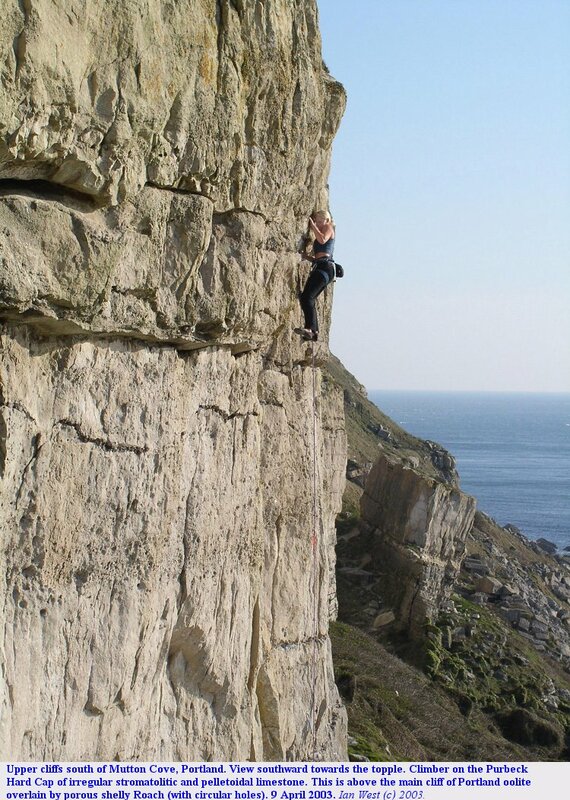 Rock-climbers use the vertical upper cliffs to the south of Mutton Cove and have their own names for certain rock features. 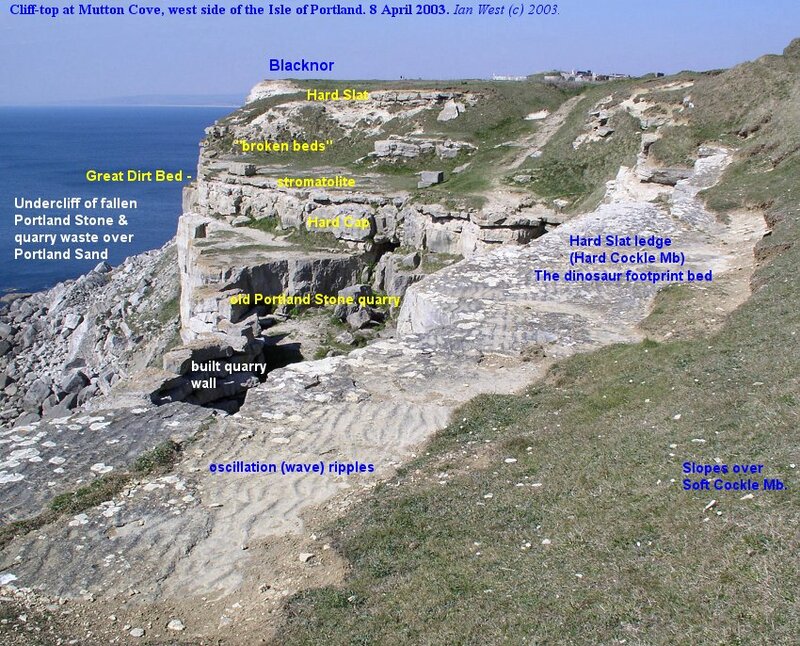 The western cliffs of Portland between Mutton Cove, south of Black Nore, to Wallsend, near Portland Bill, are of special interest because they reveal the thickest section of the Purbeck Formation. Here is present gypsum and celestite that is not preserved or exposed elsewhere on the peninsula. 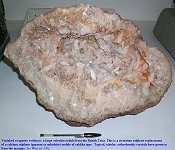 The gypsum has long been known as 'Portland Alabaster' and there is a specimen in the Portland Museum but it has rarely been seen and is not mentioned in the standard geological memoirs. The celestite was discovered by the present writer back in the 1960s and is referred to briefly in a report of a Geologists' Association field trip (West, Shearman and Pugh, 1968). This report provides detail that is not published elsewhere. The cliffs here can be considered as showing a profile of three main parts. The lowest part, next to the sea is a sloping irregular slope of fallen jumbled rock and finer debris, including clay. This obscures part of the Portland Sands. Next above this is a vertical wall of Portland Stone with some basal Purbeck limestones (the Caps) on top. Of particular interest here is the upper slope of Lower Purbeck marls and clays with thin limestones and dolomites. The Lower Purbeck succession almost reaches the Middle Purbecks. 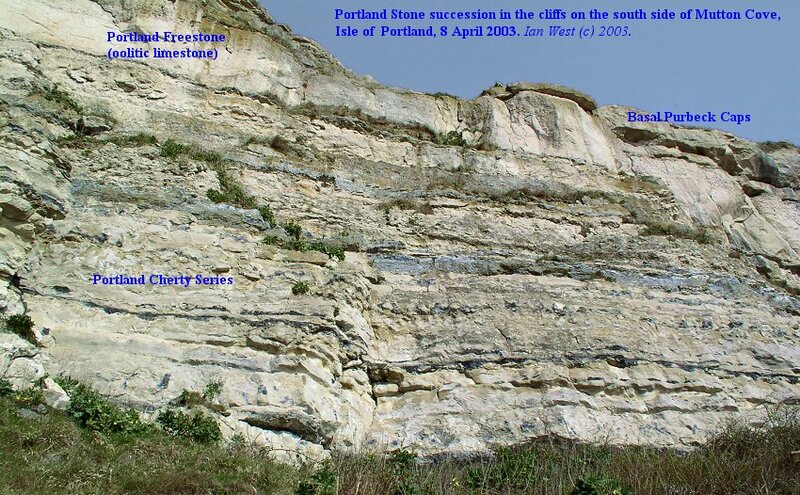 Indeed, large blocks in the Portland Raised Beach north of Pulpit Rock include pieces of Middle Purbeck Cinder Bed and Cherty Freshwater Limestone. 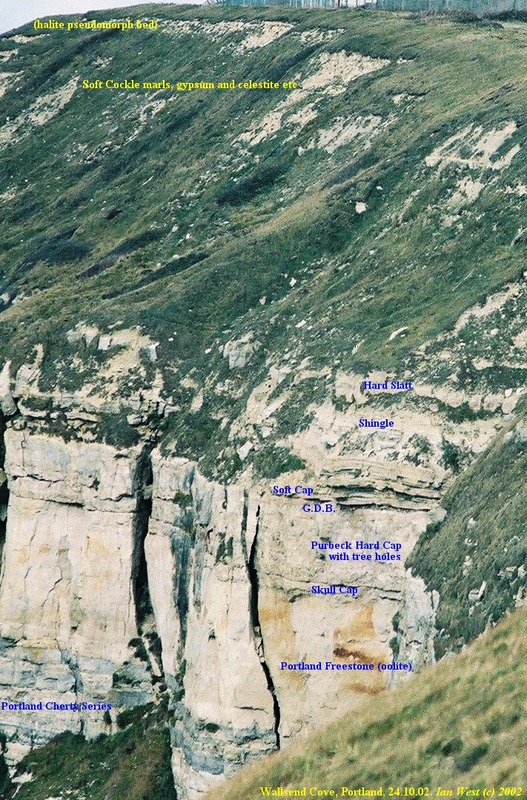 The interesting feature of the upper cliff slopes is that they provide some exposures of the Soft Cockle Member of the Lower Purbeck. The gypsum in this is the equivalent of that clearly exposed at Durlston Bay and Worbarrow Tout. This Portland Alabaster is rarely well-exposed but can be found by excavation. The photograph shows a chance exposure in October 2002 resulting from a small landslip near (just north of) the Coastguard Hut. Associated with the gypsum is strontium sulphate or celestite, the characteristic evaporite-replacement mineral, a much less soluble material that persists through weathering. Some of the crystals are large enough to be visible in the hand-specimen, and there is, in addition, much more finely-crystalline celestite. Exposure of this varies from time to time. Note that a hazard relates to the hammering of hard nodules or beds of celestite; it is necessary to take care. Chalcedony is often present with it, mostly in the form of lutecite, and this can splinter dangerously. Note that the cliffs here, however, are very dangerous and descent onto the upper slopes above the vertical Portland Stone should not be attempted. A slip could be fatal! 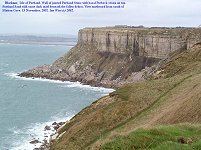 This stretch of cliffs can be viewed in general from a good coastal footpath above, but for detailed study it is sensible to go elsewhere. 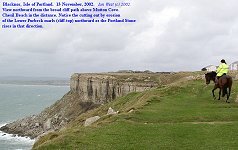 The diagram, shown above, gives the general succession or Portland strata present on the Isle of Portland. The upper part of this can be seen at Mutton Cove. The lower part of the sequence, the Portland Sand, is not well-exposed here. Parts of it are visible on the lower part of the undercliff, near the sea. Some dark grey sandy marls with nodules are exposed at beach level south of Mutton Cove, for example. To see a good succession of Portland Sand in situ it is better to study the cliffs further north on the north side of Blacknor. At the base of the Portland Stone there is a notable shell bed with a rich fauna. The mollusc shells are firmly cemented into a grey, rather argillaceous, fine-grained limestone. 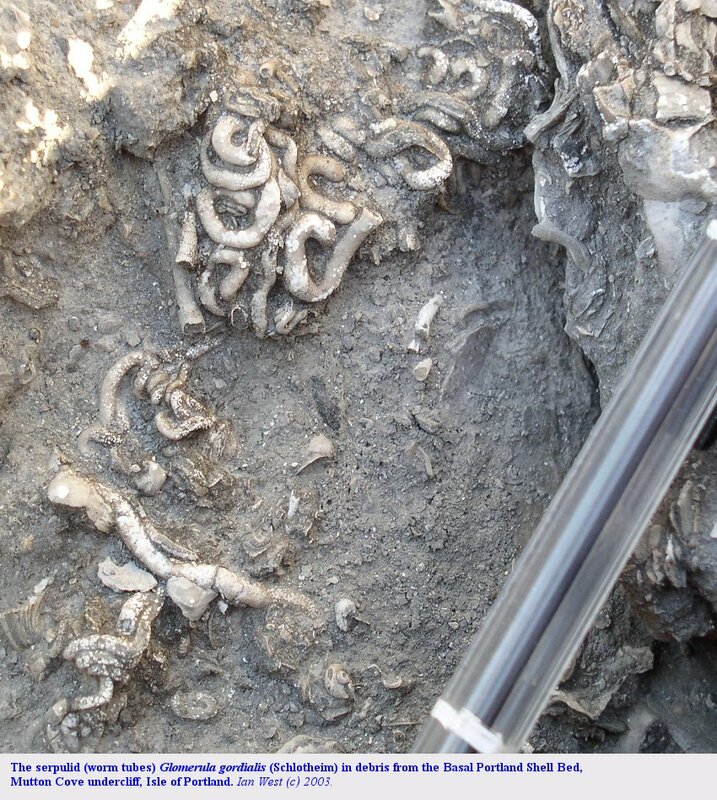 Some bivalves and serpulid tubes are shown here as a small example of the type of fossils present. These particular specimens were seen in large fallen blocks on the beach on the south side of Mutton Cove. 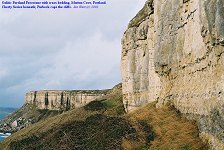 Vertical cliffs of Portland Stone are accessible from a steep footpath down the cliff at the old weare or quarry tip to the south of Mutton Cove. Both north and south of the descent are more or less horizontal footpaths running along the undercliff. These are much used by rock climbers. The cliffs here are very popular for rock climbing being vertical in well-lithified limestone and with access from above and from below. The paths used by the climbers provide convenient access for geologists. The oolitic Portland Freestone overlies the Portland Cherty Series. 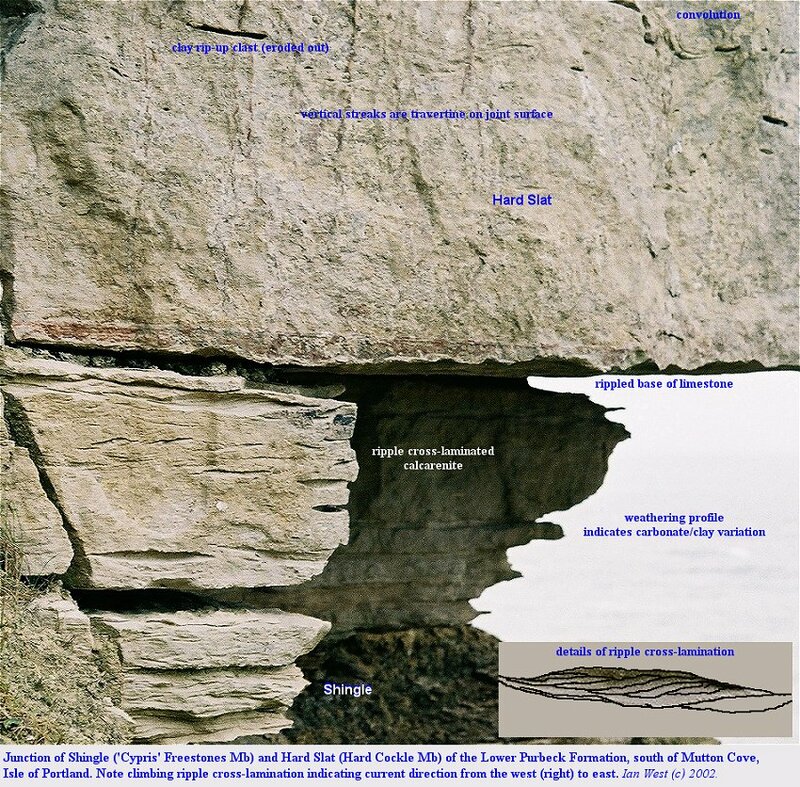 The undercliff paths give good access to the chert-bearing limestones and the forms and origins of the chert nodules can be studied (do not hammer them because of dangerous splinters). The source of the silica was originally the opaline spicules of a sponge - Rhaxella . These spicules are quite conspicuous under the microscope, because although they are very small (silt-size), they have characteristic kidney shapes. They are extremely abundant in the rocks of the Cherty Series. The spicules have mostly been replaced by calcite and the silica has migrated in solution to certain centres where chert nodules were formed. 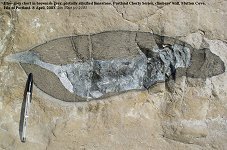 This happened within about 5 million years or so because detrital, reworked fragments of Portland chert are found in the Upper Purbeck Formation at Friar Waddon near Upwey (West and Hooper, 1968). An early origin is supported by the replacement by silica of aragonitic shells in Portland chert. This seems to have occurred before the dissolution of aragonite that is some widespread in the Portland Stone. The chert nodules were probably originally of opaline silica but they are now of chalcedony. This bluish-black chalcedony is not as fine-grained as is the flint in the Chalk. It is often fractured within the formation in a roughly rectangular manner and as a result does not normally break with the conchoidal fractures that characterises flint. An interesting problem is the rhe relationship of the partially-silicified limestone to the solid chert. This is not well-understood and it is not clear as to which appeared first. In places the overlying Portland Freestone is accessible. This is largely but not entirely oolitic. This often shows cross-bedding. This is the consequence of deposition in the shallow shoal conditions in which oolitic sediments usually originate. 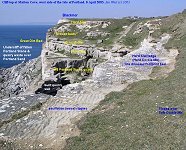 At the southern side of Mutton Cove there is a grass slope down to the Portland Stone, where, with care, the lagoonal basal Purbeck strata can be accessed. 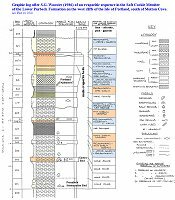 The Skull Cap and Hard Cap are in normal facies of stromatolitic and pelletoidal limestone. The Great Dirt Bed with pebbles is well-seen. Above this the Soft Cap or Soft Burr is partly stromatolitic. Calcitised evaporites are likely to be present in the sequence that follows, but as yet this has not been studied petrographically at this locality. 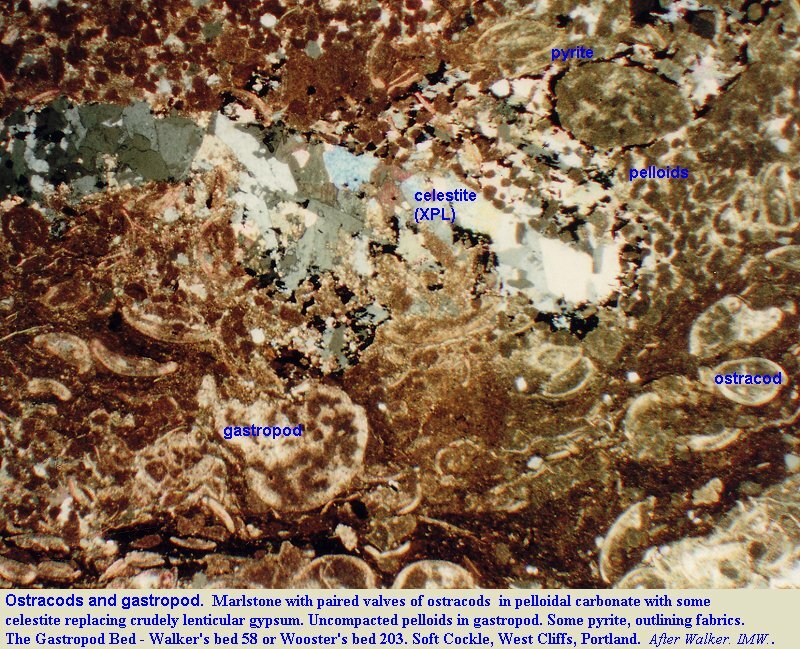 The occasional brown-staining is probably the result of oxidation of formerly pyritic layers. 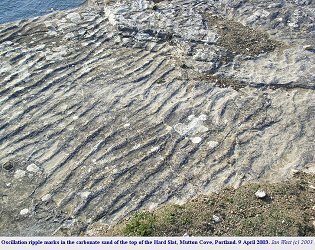 Above is the ripple-laminated and shaley Shingle, the equivalent of part of the 'Cypris' Freestone Member on the mainland, followed by the Hard Slatt, equivalent of the Hard Cockle Member. One image shows enlarged detail of the base of the Hard Slatt above the Shingle. 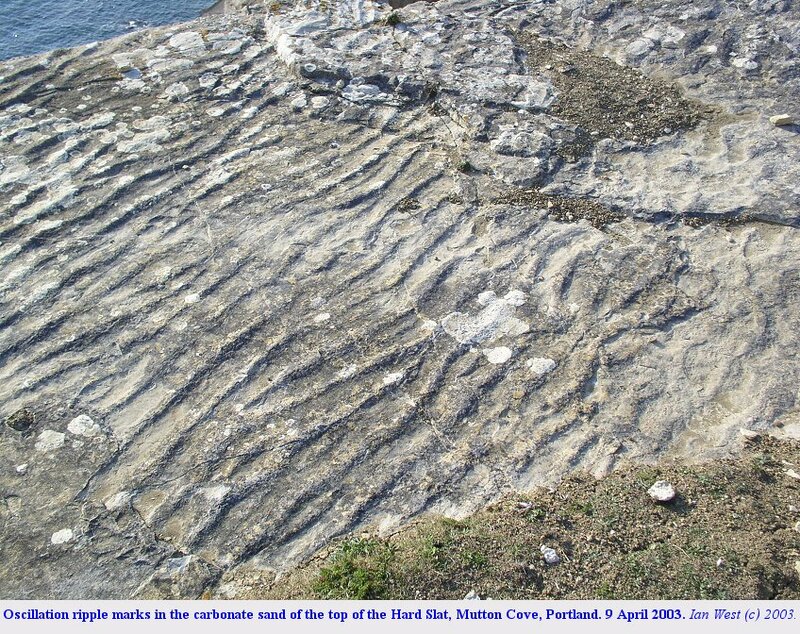 Here there is small climbing-ripple cross-stratification. This is probably unusual; although there is much ripple cross-stratification in this part of the sequence it is not usually of climbing type. It is probably mostly the result of the action of small waves in the very shallow areas of the great hypersaline lagoon. 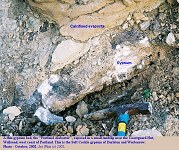 The prominant calcarenite, the Hard Slatt, contains dinosaur footprints in places, although they have not been found just here. 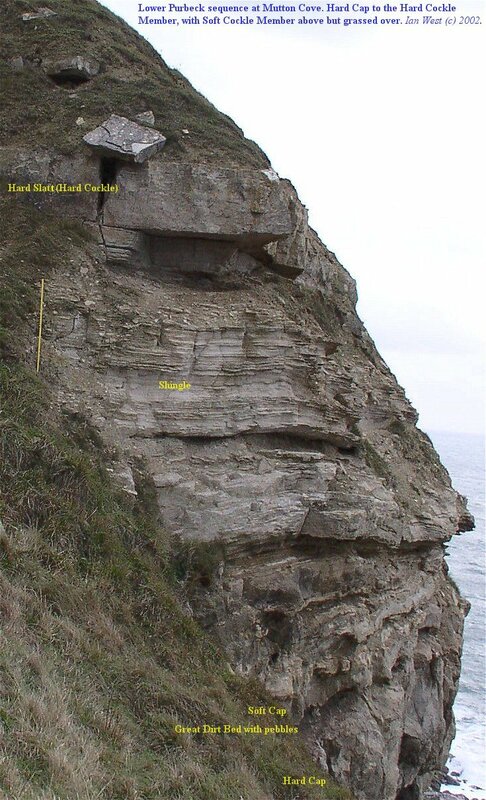 The Hard Slatt is also unusual for the Lower Purbeck Formation is being relatively coarse-grained, as a result of a high energy environment. 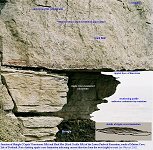 At times wave or current action was sufficient to break-up and lift mud-clasts from mud surfaces with desiccation cracks. In the cliff here the mud-clasts or rip-up clasts have been eroded out, leaving near-horizontal hollows. 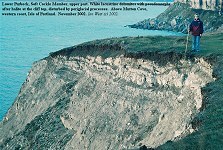 Above the central embayment of Mutton Cove, a short distance further north, than the place shown in the higher photographs, the Hard Slatt is well-exposed as a ledge on the cliff top. 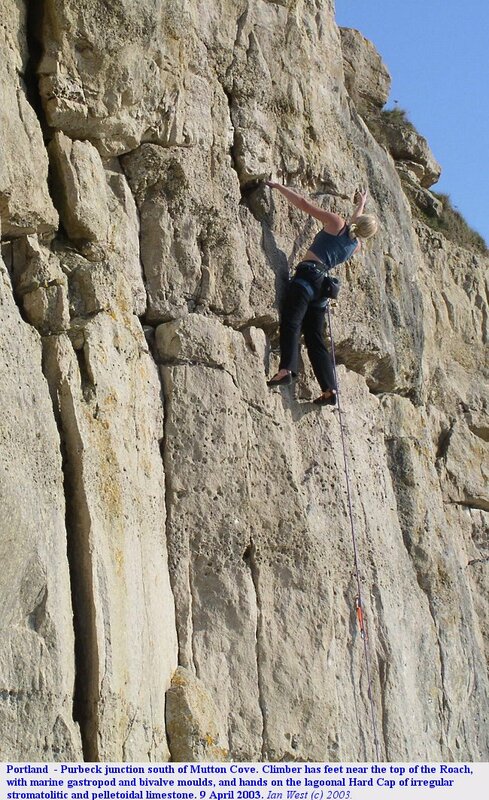 It is just above an old cliff quarry in the Portland Stone, and seaward of a housing estate of Weston (there is a small car-park here for climbers and walkers). The most conspicuous features are the ripple-marks on the top surface. These branch and appear to be oscillation, rather than current ripple marks. They are similar to the type of ripple marks that are commonly seen at low tide on modern beaches. 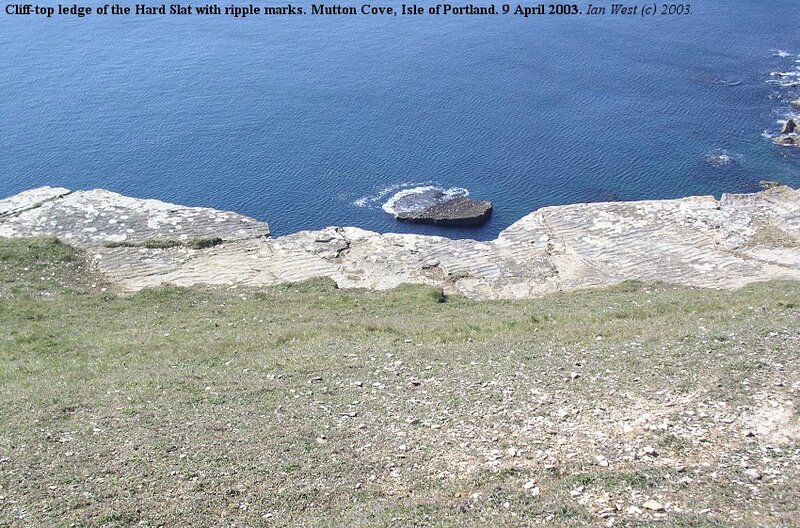 As the photographs show, the Hard Slatt is well-exposed in a cliff-top ledge directly about the centre of Mutton Cove. The bed here is thicker than at some other places and is divided into two parts by a central parting of shale. The Hard Slatt here also contains discontinuous white clay partings and many clay rip-up clasts. 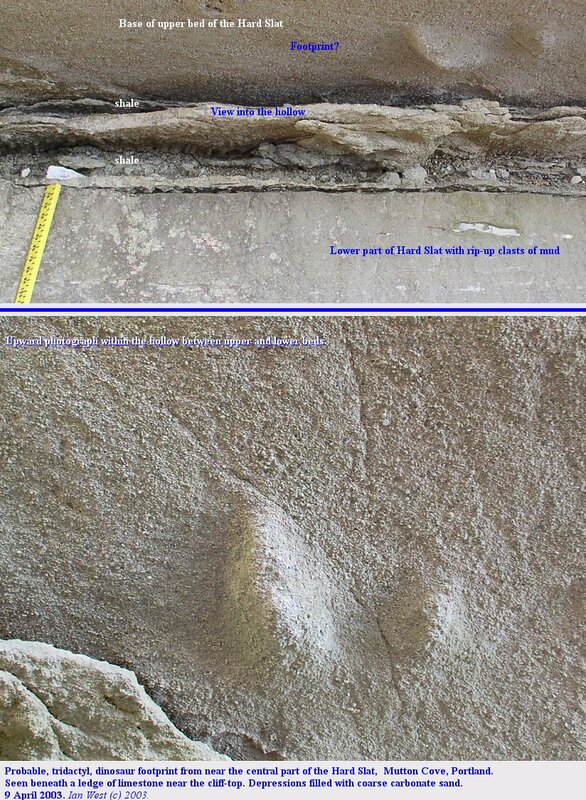 At the base of the upper part of the bed is what appears to be a cast of a tridactyl dinosaur footprint. The surface at the top of the shale, or mud, as it was, has been indented by three toes and a slight impression of a heel. 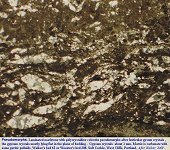 There is no obvious bourrelet and halite pseudomorphs were not seen at this level (although they occur in associated strata beneath the Hard Slatt). 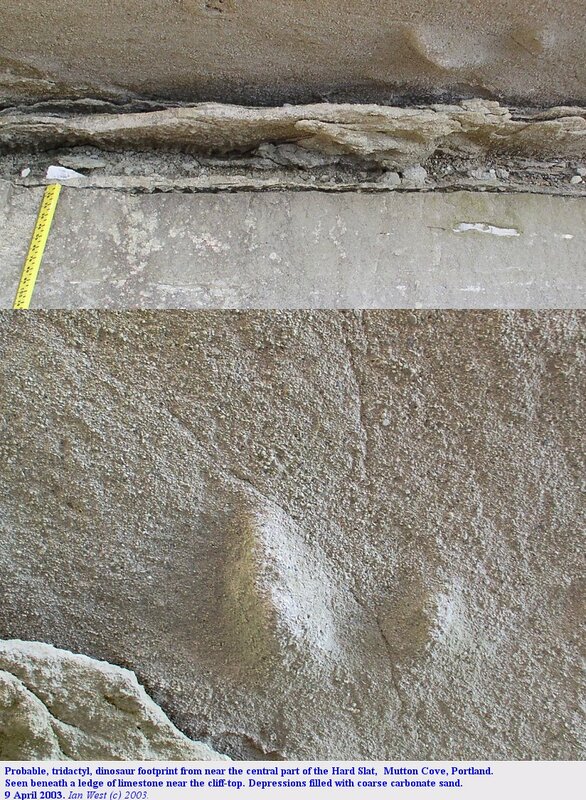 The significance of this footprint is that dinosaur footprints are not confined to one locality and not confined to the base of the Hard Slatt. The conditions were not only favourable for dinosaurs in this region during deposition of the Hard Slatt, but that the special sedimentary characteristics of this bed, particularly the content of coarse carbonate sand, were appropriate for preservation of footprints. It is hoped that more footprints may be found elsewhere in this bed. 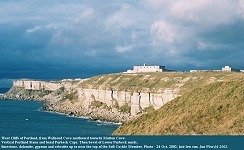 The Purbeck succession can be established to some extent in the stretch from the Coastguard Hut near Wallsend to Mutton Cove. Because of some difficulties of access and exposure the section may not be precise in detail. The photographs (note the scale of one metre) and drawn section provide a guide, though. The section will be improved as more information is obtained, but at present should be regarded as provisional. More detail on the Purbeck Soft Cockle succession here could probably be obtained particularly with aid of ropes, particularly since rock-climbing takes place here (but note that the cliff top is used for cantering horses and ropes must not be stretched across the path). It must again be stressed though that these cliffs are dangerous and scrambling here for geological purposes is not recommended. Celestite or celestine, strontium sulphate, is common in the Lower Purbeck Formation in association with calcium sulphate, either as gypsum or anhydrite. 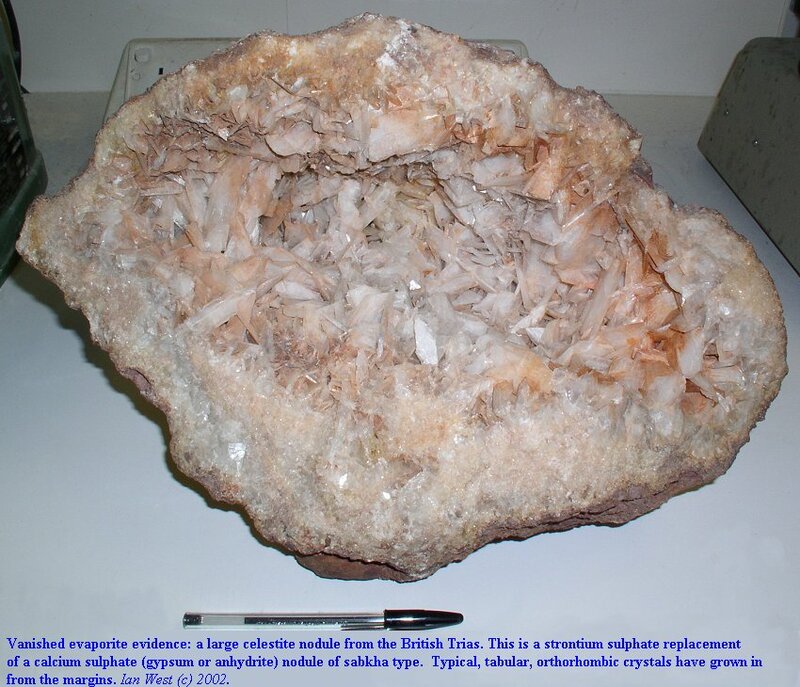 A large nodule of celestite which has replaced evaporites in the Trias of England is shown here. 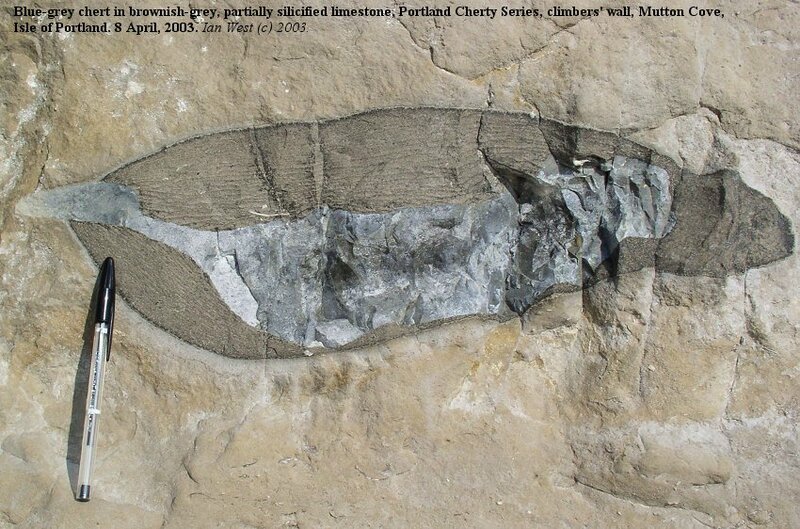 This Triassic specimen is about four times larger than nodules found in the Purbecks of Portland, but shows the tabular crystals very well. The mineral celestite is orthorhombic and resembles the related barium sulphate - barite or barytes but has a specific gravity which is high but not as high. A specimen can sometimes be recognised by its weight. Although occasionally coarsely crystalline, it is mostly fairly finely crystalline and generally colourless. Ideally celestite should be slightly bluish, hence the name, but this is not usual in the Purbecks. As a result it is not conspicuous in the field, except where coarsely crystalline. In thin-section it is recognised by its low birefringence, high relief, good cleavage and some straight extinction. Although easily seen in thin-section, it can be confused with barite. X-ray diffraction is a quick and easy method of distinguishing it from the barium sulphate. Note that in some places, although not here, baritocelestite occurs, and this is the sulphate of both barium and strontium. To find celestite in the field use a hand-lens and look for the tabular crystals, a hardness greater than gypsum and no reaction with dilute hydrochloric acid. I have in the past used a spray of the calcite stain, acidic alizarin S, in higher than normal concentration to find it by spraying suspect areas of rock. Calcite turns red but the celestite crystals remain unstained. 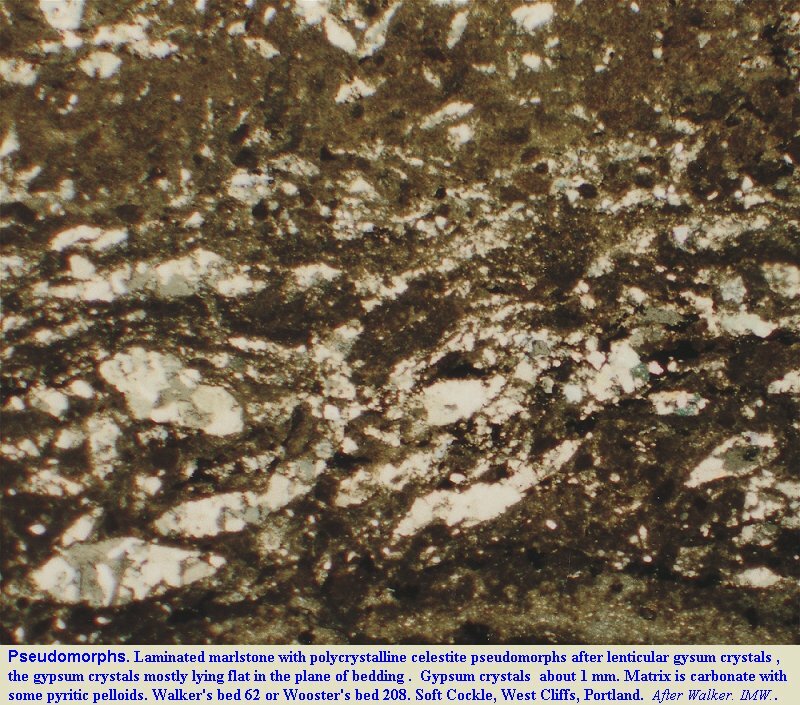 As shown by (West, 1973) celestite can be and has been used as part of the evidence to detect the former presence of evaporites ("vanished evaporite"). 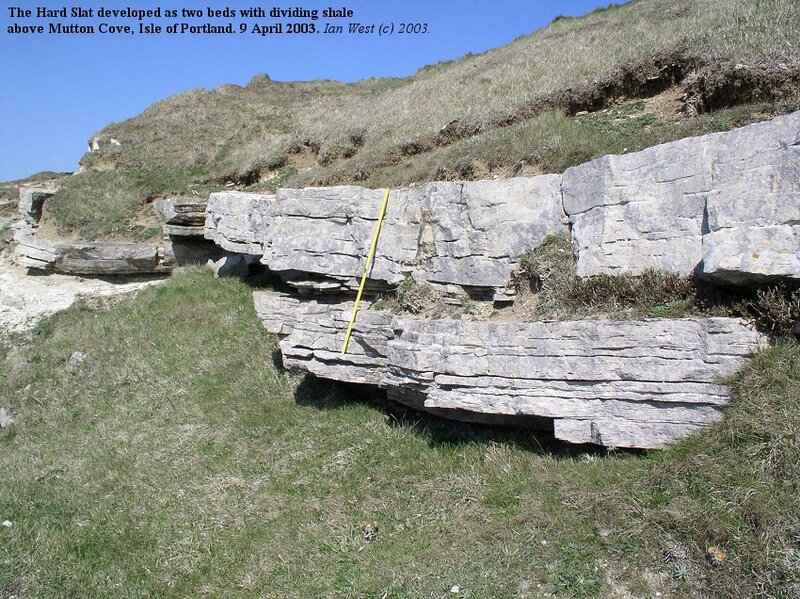 It was first used for this purpose by the present author in 1960 (West, 1960) when the Broken Beds of the basal Purbeck at Durlston Head, Swanage were shown to be in part of evaporitic origin. 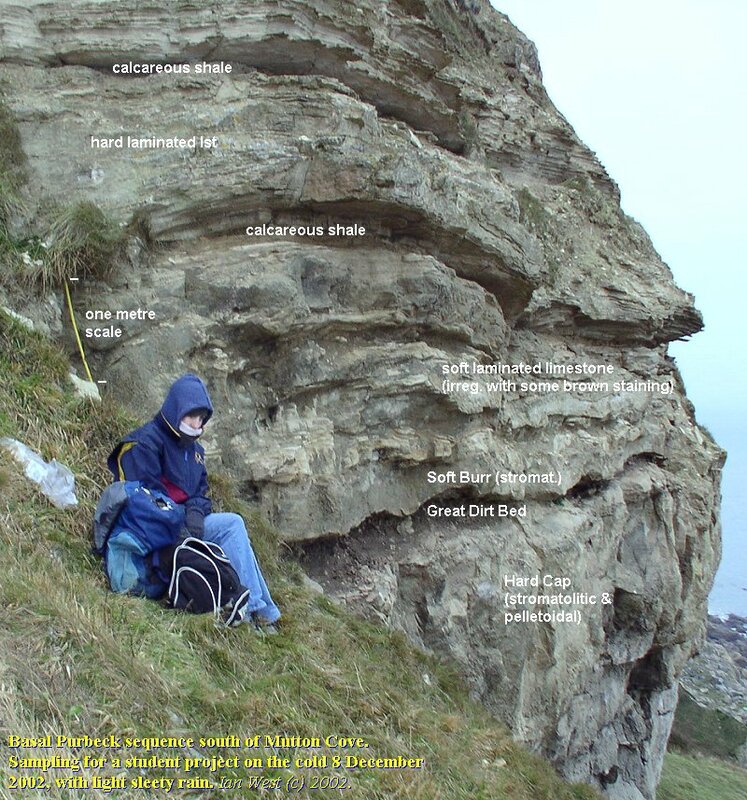 At Durlston Head it replaces anhydrite and is associated with calciostrontianite (Salter and West, 1965) . It is also present in the Soft Cockle Member of Durlston Bay, associated with the gypsum. It is present in the Soft Cap on the central ridge of Stair Hole . 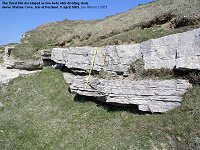 It occurs in the basal Purbeck evaporitic strata of Worbarrow Bay (West, 1975) . It occurs in the basal Purbeck evaporites of the Mountfield Mine, Sussex. Obviously it must occur elsewhere still unrecognised in the evaporitic parts of the Purbeck Formation. The mineral is so insoluble that it very commonly persists when evaporites have been dissolved. It is one of the best "vanished evaporite" indicators! Note, though, that when searching for evidence of "vanished evaporites" several points of evidence should be used, not just one. With celestite, look for lutecite and length-slow chalcedony, nodular or chicken-wire fabrics, the smaller scale net texture, high porosity, calcitisation fabrics, plastic flow, brecciation, euhedral quartz, anhydrite relics, pseudomorphs etc. 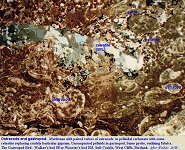 There can be a wide range of petrographic evidence and once some petrography has been done, and with experience, it is easy to recognise "vanished evaporites" in the field, even without the petrography. If necessary isotopic studies can provide supplementary evidence (as has been done in the case of the Purbecks in a thesis by Quest). Elsewhere, as in the Pyrenees and the Alps "vanished evaporites" are known as cargneules or rahwackes and are normally of yellowish spongy, brecciated, calcite or dolomite, often with euhedral quartz crystals. 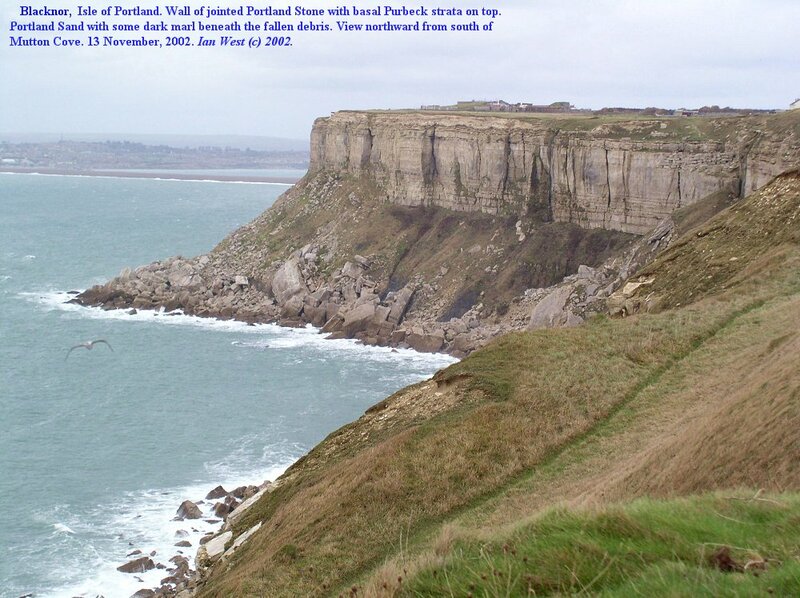 On the West Cliffs of Portland it was first found by the present author in the late 1960s. 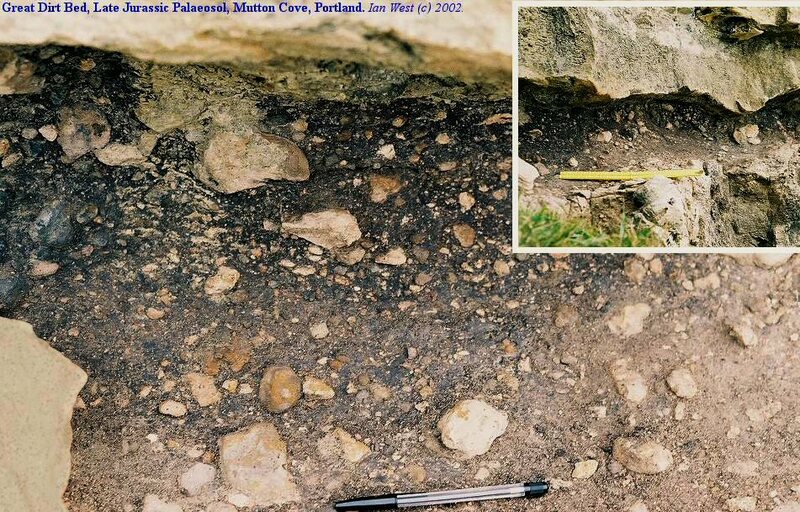 Nodules of coarsely-crystalline celestite, replacing large anhydrite nodules (probably secondary after primary gypsum nodules) were found on the upper slumped cliffs near the coastguard hut of Wallsend. This was the result of small landslide movement at the time at the appropriate horizon and the nodules do not seem to be visible now. Later more systematic search of the cliff tops and some vigorous excavating yielded bedded celestite. It extends to Mutton Cove. This is finer-grained and rather ferruginous. It is closely associated with thin beds of gypsum. The gypsum is now secondary having gone through the diagenetic gypsum-anhydrite-gypsum cycle. 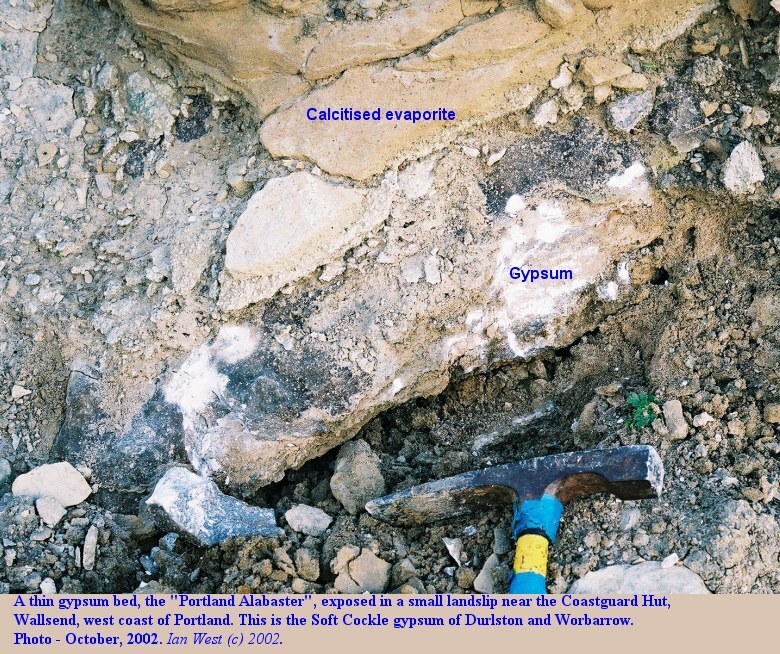 The gypsum bed has, as is commonly the case, been partially calcitised and partially replaced by strontium sulphate, as a result of circulating carbonate-rich groundwater. The date of celestite replacement here is not known. Further study here is needed but the poor exposures at the top of a dangerous cliff do not make this easy. 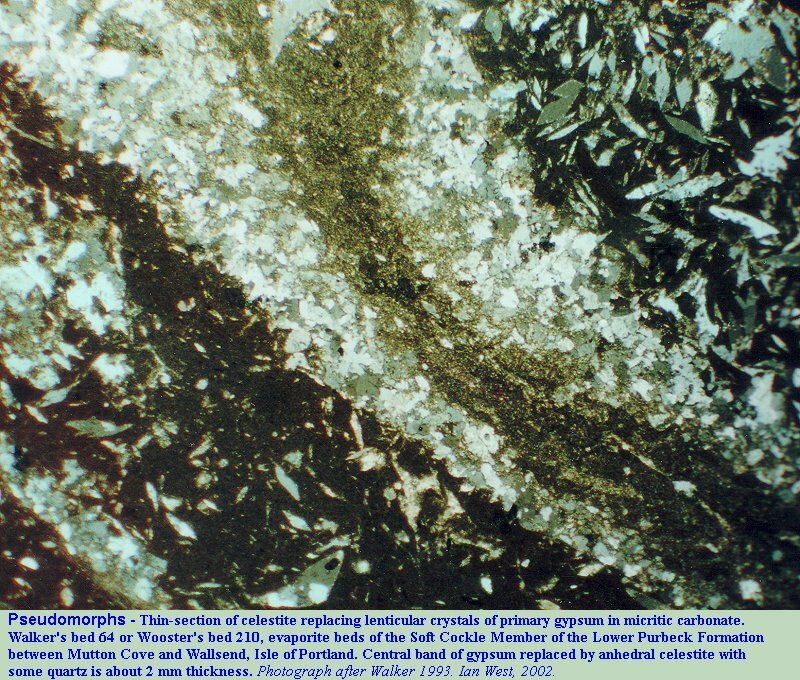 In the Purbeck Formation celestite commonly replaces gypsum or anhydrite and this is seen in this thin-section. The replacement of calcium sulphate by strontium sulphate in these strata is not necessarily simple, however, and can take place at various times and in various situations. 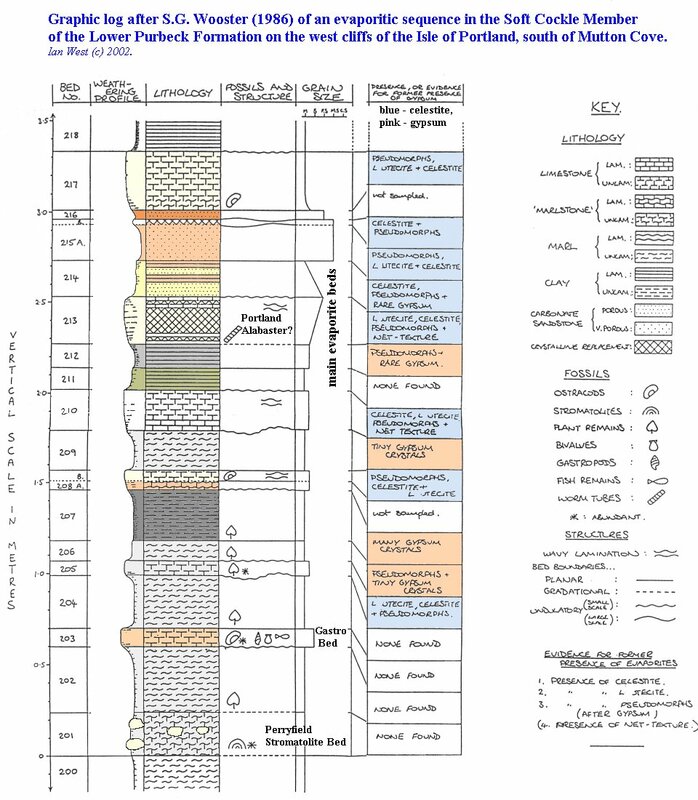 Firstly, the usual calcium sulphate diagenetic history of the Purbeck Formation, which has long been established at many localities (West, 1964a; 1965) , must be considered to understand the celestite replacement processes in perspective. Geomorphologically this is an interesting stretch of coast. 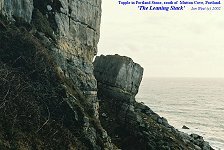 There is a skirt of debris over Portland Sand at the base, a vertical wall of Portland Stone above, and an upper slope of weaker Purbeck marls and thin limestones that slumps from time to time. The lower part of the cliff shows some interesting rotational landslides and also some topples. The "Leaning Stack" shown above is a good example of a topple. Gilbride mapped these landslide units in 1994 on an old base map. This is reproduced above, left. 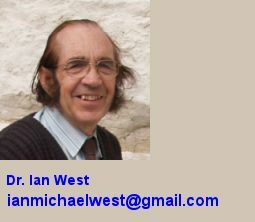 I am very grateful to Jenni Will for help and discussion with regard to Purbeck facies and dinosaur footprints. 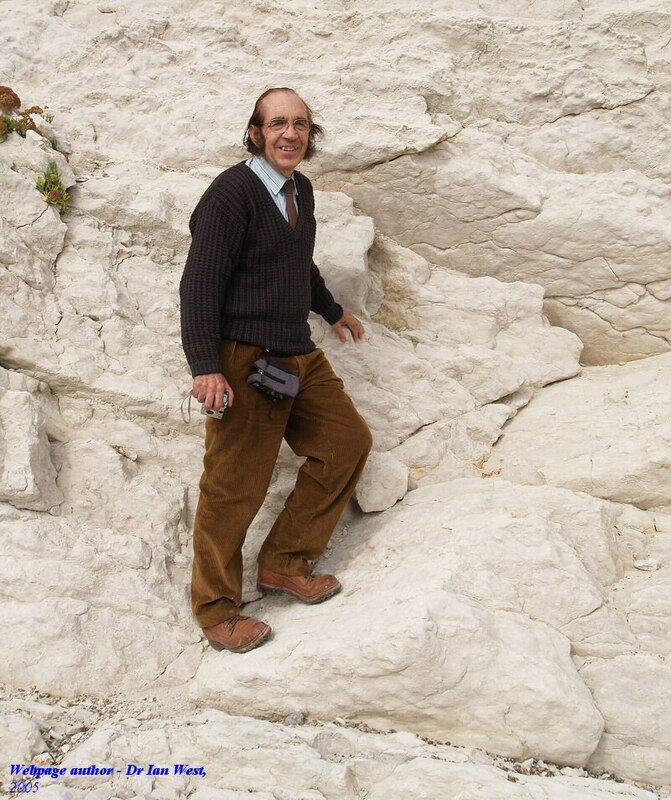 Several former students, including Jennie Neve, Simon Wooster, Philip Gilbride, Josephine Walker and Caroline Clasby have provided assistance and valuable help in the field and laboratory with regard to the geology of these cliffs. 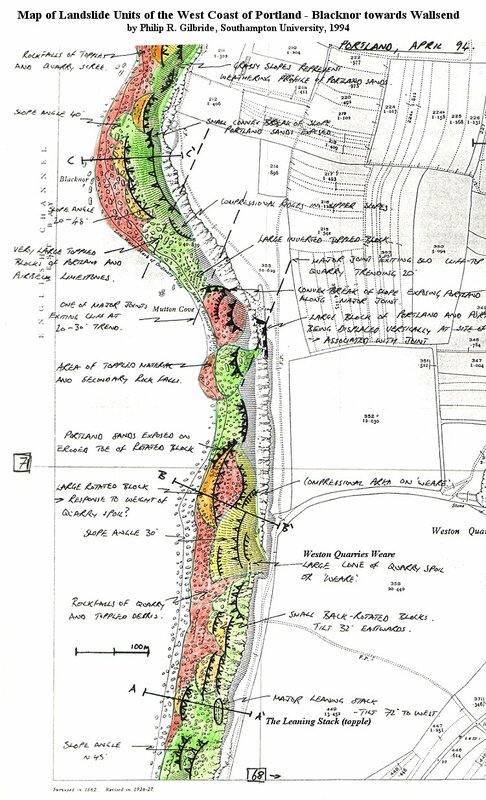 They have produced useful project reports on this or adjacent stretches of coast or quarries. This is very much appreciated.